Whimsie Doodles is having a fun challenge this month! It's called Spring Fling! So get your creative juices flowing and create something that reminds you of spring. It could be flowers, spring colors, Easter, Bunnies, etc. I used the adorable image from Whimsie Doodles called Egg Painting. You can get him here. I wove strips of paper together to create the background, then added a doily from MFT Die-namics Dies. On the doily I put grass using a Martha Stewart grass border punch. Made a blue sky using Distress Ink - broken china, and added clouds using MFT Die-namics cloud die. A little faux stitching, then some bling. Oh yes, got to have some bling. LOL Then bunny was added with some pop dots to make him stand off the card a bit. So head over to Whimsie Doodles and enter their monthly challenge today! This is simply adorable. I love the Easter Bunny. So cute Dawn, I love those MFT dies, I wanted to order some, but I am always so scared if I order something from overseas it will go "missing", it's known to happen in this neck of the woods!! Great card Dawn, I love your paper weaving and that cute image. Dawn, This is just adorable! I love Whimsey Doodles! Great job! 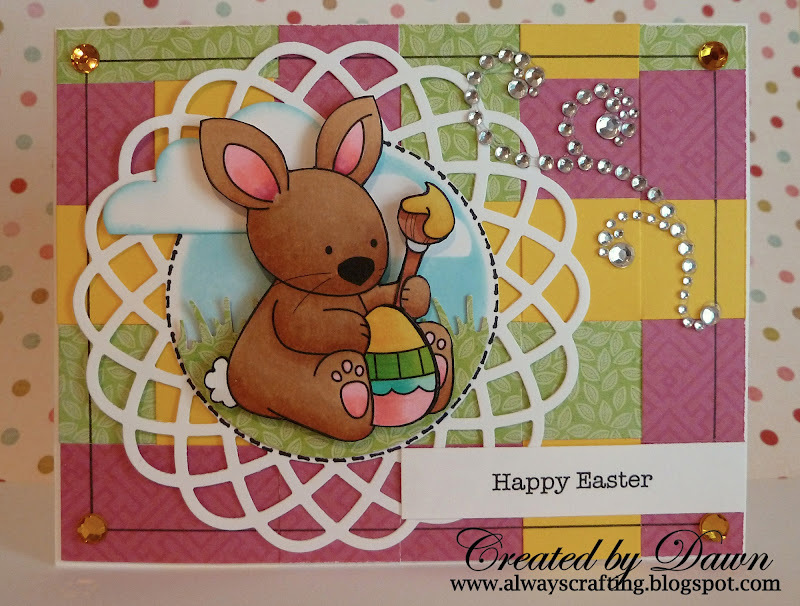 How cute and springy- you should come and join us on the ABC DT challenge this month. Dawn, this is so cute! Love the little scene you created for the bunny :>) So glad to have you joining us this month at WD!!! So cute, thanks for playing along with CMM!